Most authors will tell you that the fictional world of their books comes from a real world inspiration. - a news item, an overheard conversation, or perhaps a personal experience that sparks off a chain of inspiration. There is another purpose of storytelling - to memorialise a true story so that friends, family and future generations can see history through the eyes of those who lived through it (and often those who did not). I'm grateful to Carol Browne for making time to discuss her work on Being Krystyna - A Story of Survival in WWII. 1. What was it that drew you to the project? 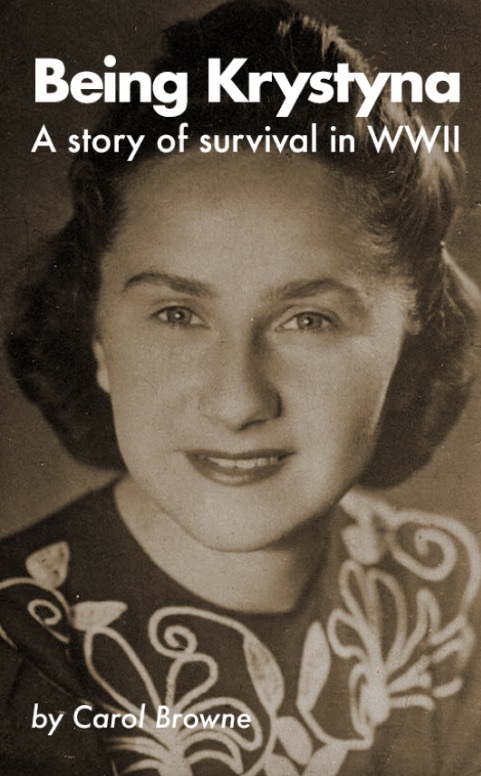 I volunteered to write the life story of local woman Krystyna Porsz after a chance meeting with her son in a Polish restaurant in 2011; but I was a very reluctant biographer. I did it because no-one else could be found who was either able or willing to take it on and that was my only reason. I thought, “If I don’t do it, no-one will.” It seemed far too big a responsibility to me but I told Krystyna’s son I’d give it a go, even though I was convinced I wasn’t up to the job. I write fiction. I make stuff up. I assumed non-fiction would be completely different. 2. Did your approach differ from writing fiction? I discovered that non-fiction and fiction aren’t so different after all because the author still needs to provide the reader with a compelling read. It can’t be written as a chronological series of events or it will be very dull. In the case of Being Krystyna - A Story of Survival in WWII, although I had the facts of Krystyna’s life, they amounted to a few sheets of A4 paper, hardly enough material for a book. So I had to build a structure to hang those facts on, very much like creating a plot for a work of fiction. A young Polish friend of mine had visited Krystyna on two occasions and I used her as a narrative device, so we see the story unfold through her eyes. This gave me much more opportunity to expand the text while still being true to the available facts. It also added another dimension to the story, comparing the very different life experiences of two Polish women. Additional challenges, however, present themselves when you remember you are dealing with someone’s actual life. Writers of fiction know that characters are apt to take on a life of their own. They seem real to their creators and as authors we want to portray them in their best light. When you are writing a real person’s story, this becomes vitally important. The sense of responsibility the author feels is magnified. For me, writing about Krystyna, it was off the scale; here was a very old lady whose ability to communicate was seriously hampered by dementia. There wouldn’t be any chance of being able to discuss the book with her. There wouldn’t be any feedback. While I was writing the book, I kept thinking, “If this were my life story, would I be happy with how it’s being handled?” That was my benchmark all the time and I’m confident I kept to it. 3. How did the experience change you? 4. Where can we find out more about Being Krystyna? Being Krystyna is available in Kindle format on Amazon.